We support people with intellectual and developmental disabilities. The Arc Baltimore serves people with intellectual and developmental disabilities and their families in Baltimore City and Baltimore County. Our services are far reaching and have high impact, for young and old. Whether a child or adult has autism, Down syndrome, cerebral palsy, epilepsy, or any other similar condition, it’s our job to support them so they can live in the community as independently as possible. The Arc was started by parents when there were no services available for their children with disabilities. Today families are partners in our efforts to continue opening doors so that their young and/or adult children have maximum opportunities to grow healthily, learn to their maximum ability, make friends, and have access to jobs and homes in the community like anyone else. Our programs are designed to meet the needs of each individual person. For some that means 24/7 support. Others need more basic assistance, but equally important for them to living as independently as possible. 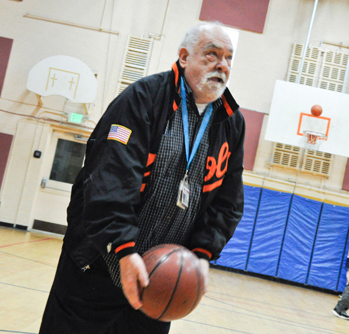 Community Living supports nearly 300 people in homes across the Baltimore area. Typically three roommates live together and have staff for support in the home as well as assistance to get to doctor appointments or activities in the community. Some individuals live on their own, but receive drop-in help 3-4 times a week for shopping, banking, and meal prep. 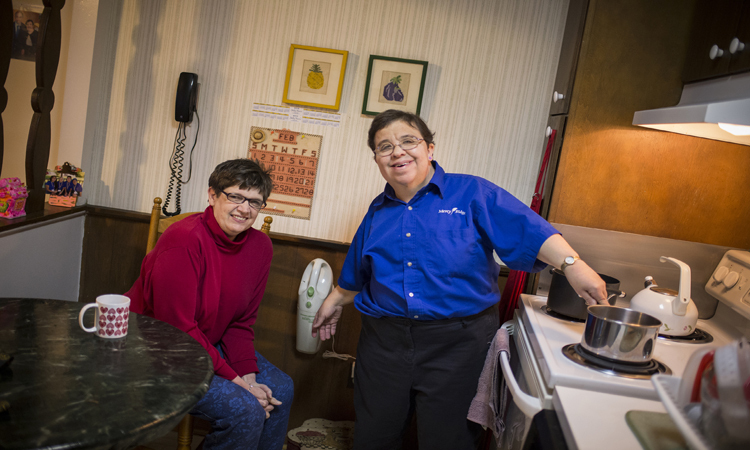 Similarly, Family Living provides staff to people with disabilities who live in their family’s homes. Sometimes a parent of a child with significant disabilities may need assistance with some of the physical care or other needs, especially if there are other children in the home. Or, a parent in their 70s or 80s may have their adult child still living with them and they can no longer provide some of the physical care required, or the opportunity to get out. Staff from The Arc work with the families to meet those needs. Employment services provide career exploration, training, internships, and jobs for hundreds of people. We support people in diverse types of jobs at companies such as: Alban CAT, Union Memorial Hospital, University of Maryland Baltimore, Marshall’s, Horseshoe Casino, Stella Maris, Wegman’s, and many others. Additionally, The Arc has six day programs where people spend time on-site for activities and care as well as launch from for jobs, classes, shopping, visits to area attractions, movies, bowling, and other experiences. Lastly, Family Services offers many opportunities for parents and caregivers – family support groups, a Parents’ Day Out respite program, education programs, financial assistance, networking, and ongoing information and referral. Treatment Foster Care is also providing both long-term care and short-term care to foster children. 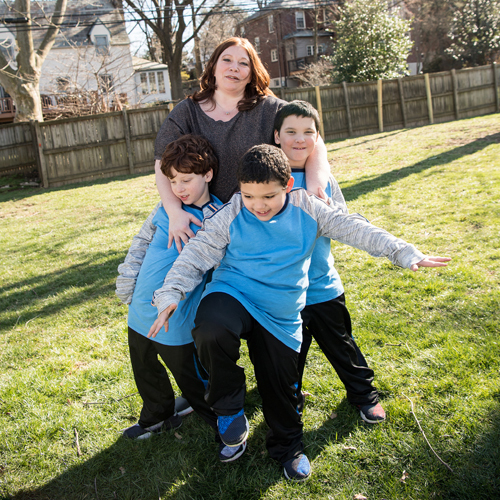 Families often refer to The Arc Baltimore as a lifeline. We meet their needs where they are. A parent of a toddler with autism has very different challenges than an aging parent trying to ensure that their child will be supported when they are gone. We are there for both of these situations and countless others. While there are other organizations serving the disability community, The Arc has been in existence for 68 years and has a history of accomplishments and innovation. That continues today. For example, we are now a leader in the use of assistive technology for people with disabilities to be able to communicate more effectively and to have more independence in daily living and work. We use iPads, special keyboards, recorder devices, and adaptive tools and utensils to make many tasks simpler that are challenging for people with disabilities. Technologies, both sophisticated and simple, can make a difference in what a person is able to do for themselves rather than what must be done for them. Over the years, The Arc Baltimore has helped close State institutions where people with disabilities had very limited options and segregated lives. We opened the first group home in Maryland as part of that effort. We gave people work through sheltered workshops, and then in later years, we closed those workshops in favor of developing more work opportunities in the community. In 2008, we started the first Project SEARCH program in Maryland to bring high school students with developmental disabilities to the University of Maryland for an internship to work program. We now have four such programs and a hybrid program that has resulted in paid jobs for dozens of students and young adults every year. The Arc Baltimore is certified by CARF for its practices as a disability services organization, and by the Standards for Excellence program for its ethical and accountable practices in matters of governance, financial management, and other operational measures. In addition, The Arc is audited each year by an independent auditor. The Board of Directors has 21 members presently and has active committees: Finance, Human Rights, Quality Enhancement, and Development and Marketing. The Board provides oversight of key functions and standards of the organization. On a daily basis, the executive director, with more than 30 years of experience, works with a seasoned management team dedicated to the mission and vision of The Arc.